Two items here on the manipulation and creation of engineered nanoparticles of gold. Read and wonder. I am expecting a lot out of this research, comparable to the output related to the work on graphene. As we follow this, I remind readers of what has been called monatomic gold. Folks playing with this stuff, were playing with fire, and making astounding claims with little convincing support. From this is is easy to see why such efforts are worthy. It is all early days yet I think this work will provide momentum to charge ahead. Recall two years ago, a physicist injected 20nm particles into mouse bloodstream and then when they accumulated naturally inside cancer cells, he applied radio-wave heating to kill those cells. This is nano surgery at its best. ScienceDaily (Aug. 8, 2012) — DNA holds the genetic code for all sorts of biological molecules and traits. But University of Illinois researchers have found that DNA's code can similarly shape metallic structures. The team found that DNA segments can direct the shape of gold nanoparticles -- tiny gold crystals that have many applications in medicine, electronics and catalysis. Led by Yi Lu, the Schenck Professor of Chemistry at the U. of I., the team published its surprising findings in the journal Angewandte Chemie. "DNA-encoded nanoparticle synthesis can provide us a facile but novel way to produce nanoparticles with predictable shape and properties," Lu said. "Such a discovery has potential impacts in bio-nanotechnology and applications in our everyday lives such as catalysis, sensing, imaging and medicine." Gold nanoparticles have wide applications in both biology and materials science thanks to their unique physicochemical properties. Properties of a gold nanoparticle are largely determined by its shape and size, so it is critical to be able to tailor the properties of a nanoparticle for a specific application. "We wondered whether different combinations of DNA sequences could constitute 'genetic codes' to direct the nanomaterial synthesis in a way similar to their direction of protein synthesis," said Zidong Wang, a recent graduate of Lu's group and the first author of the paper. Gold nanoparticles are made by sewing tiny gold seeds in a solution of gold salt. Particles grow as gold in the salt solution deposits onto the seeds. Lu's group incubated the gold seeds with short segments of DNA before adding the salt solution, causing the particles to grow into various shapes determined by the genetic code of the DNA. The DNA alphabet comprises four letters: A, T, G and C. The term genetic code refers to the sequence of these letters, called bases. The four bases and their combinations can bind differently with facets of gold nanoseeds and direct the nanoseeds' growth pathways, resulting in different shapes. In their experiments, the researchers found that strands of repeating A's produced rough, round gold particles; T's, stars; C's, round, flat discs; G's, hexagons. Then the group tested DNA strands that were a combination of two bases, for example, 10 T's and 20 A's. 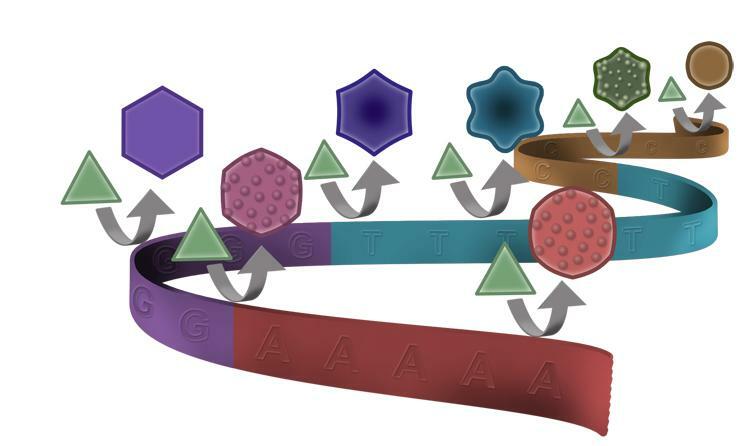 They found that many of the bases compete with each other resulting in intermediate shapes, although A dominates over T.
Next, the researchers plan to investigate exactly how DNA codes direct nanoparticle growth. They also plan to apply their method to synthesize other types of nanomaterials with novel applications. ScienceDaily (Aug. 10, 2012) — A physicist at the University of York has played a key role in international research which has made an important advance in establishing the catalytic properties of gold at a nano level. Dr Keith McKenna was part of a research team which discovered that the catalytic activity of nanoporous gold (NPG) originates from high concentrations of surface defects present within its complex three-dimensional structure. The research, which is published online in Nature Materials, has the potential to assist in the development of more efficient and durable catalytic converters and fuel cells because nanoporous gold is a catalytic agent for oxidising carbon monoxide. Bulk gold -- the sort used in watches and jewellery -- is inert but nanoporous gold possesses high catalytic activity towards oxidation reactions. The research team, which also included scientists from Japan, China and the USA, discovered, that this activity can be identified with surface defects found within its complex nanoporous structure. While nanoporous gold exhibits comparable activity to nanoparticulate gold, it is considerably more stable making it attractive for the development of catalysts with high performance and long lifetimes. They created NPG by immersing an alloy of gold and silver in a chemical solution which removed the latter metal to create a porous atomic structure. Then, using transmission electron microscopy, they were able to detect evidence that the surface defects on the NPG were active sites for catalysis and the residual silver made them substantially more stable. Dr McKenna, of the Department of Physics at the University of York, said: "Unlike gold nanoparticles, dealloyed NPG is unsupported so we are able to monitor its catalytic activity more accurately. We found that there are many surface defects present within the complex structure of NPG which are responsible for the high catalytic activity. "This work has given us a greater understanding of the catalytic mechanisms of NPG which will, in turn, shed light on the mechanisms of gold catalysis more broadly." The research also involved the WPI Advanced Institute for Materials Research, Tohoku University, Japan; Ectopia Science Institute, Nagoya University, Japan; Department of Materials Science and Engineering, Johns Hopkins University, USA, and School of Materials Science and Engineering, Shanghai Jiao Tong University, China. The research was sponsored by JST-PRESTO, JST-CREST and the Sekisui research fund.